Foxwoods Resort Casino is the premier resort destination in the Northeast which opened in 1986 and celebrating their 25th year Anniversary. As the largest resort casino in North America, Foxwoods offers a vast array of gaming in six casinos; AAA Four-Diamond hotels, restaurants from gourmet to quick service, world-renowned spas – Spa at Norwich Inn and GSpa, award-winning golf – Lake of Isles Golf Course, state-of-the-art theaters, and high-end exclusive retailers. Perfect for both recreation and business, Foxwoods provides modern and versatile convention and meeting space to infuse new life into any meeting or event. Foxwoods Resort Casino is owned and operated by the Mashantucket Pequot Tribal Nation (MPTN). 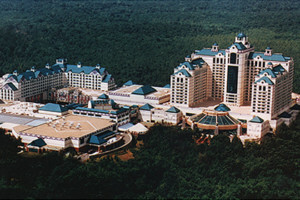 To Learn More Click the “Foxwoods Resort Casino” Logo.